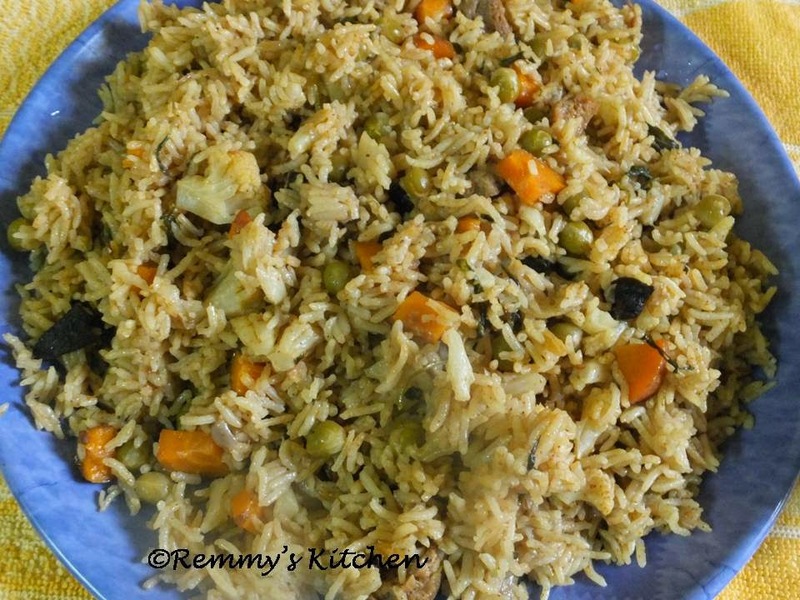 Looking for an "easy to prepare biriyani" recipe? Your search ends here! It hardly takes 10 minutes to prepare this biriyani. I would like to name it as bachelor's biriyani recipe. It is a very quick and easy recipe provided you cut all the vegetables beforehand and keep it ready for preparation. Soak green peas over night. Keep soya chunks in boiled water for half an hour before using it in the biriyani. Take it out from boiled water, squeeze, wash it in cold water and keep aside . Separate cauliflower florets and keep it in boiled water for 15 minutes. Boil the water with turmeric powder and salt. Drain and take a few florets for biriyani. Make ginger - garlic paste and set aside. Soak basmati rice for 30 minutes. Drain it and keep aside. Heat a pressure cooker with ghee and oil. Add sliced onion and saute it well. Add tomato and green chillies. Saute it well. Add ginger garlic paste and saute it well till the raw smell leaves. Add coriander leaves, mint leaves and curry leaves.Mix it well. Now add all the ingredients under "Spice powders". Stir it well. 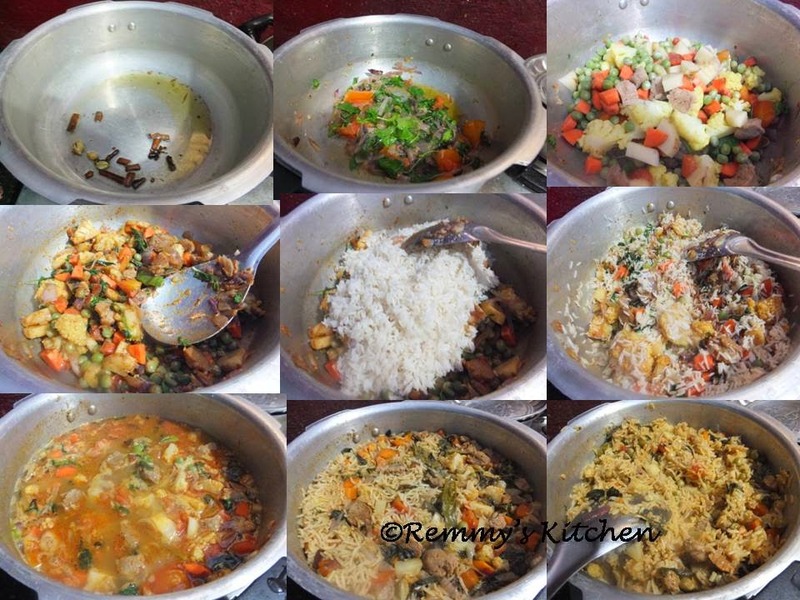 Add all the vegetables (carrot, potato, soya chunks, cauliflower, green peas) and mix it well. Add drained basmati rice and mix well. Pour 3 cups of water and add enough salt. Mix it well. Close the pressure cooker and place the weight. Keep the flame on high and wait for one whistle. Switch off the stove. Once the vapour subsides, remove the weight and open the lid. Mix the biriyani with a spatula. Serve it with raita, pickle or any other side dish according to your taste. Looks yummyyy.. thanks for the recipe ! Yum to this rice dish which will always be my all time fav.